Home » Law Life » Spiralization. Don’t Be Afraid. So on Saturday, after my 10 miles with Chelsey, I got home to find a very exciting package waiting for me. Okay, I thought it was exciting. Hahaha, I’m sure most of you think I’m insane. Well, I kinda am. But besides that, I’d always wanted to make REAL zucchini spaghetti. I had always just used a peeler, so my zucchini turned out flat, not really like spaghetti. BOOYAH! The strands were so long too! 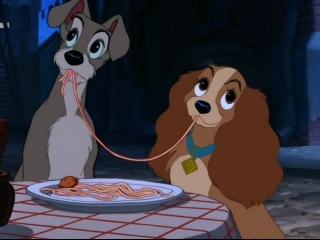 It was like Lady and the Tramp! Tada! Isn’t that so cool! and it takes seconds! There are three different blades for different thicknesses, and one can make you potato chips (or chip like shapes out of other veggies). I can’t wait to get experimenting! So yesterday, I asked you all to guess who I’d be spending the next few days with. Well, if you guessed Molly, then you guessed right!!! My brother and sister-in-law are on a cruise with her family for Thanksgiving and headed out yesterday, so it’s me and Molly until she goes to the “Puppy Hotel” and I fly home for Thanksgiving! So far we’ve dug some holes, smelled some leaves, ate an evergreen bush and looked absolutely adorable. It’s going to be a good couple days. Does anyone have a pet of their own, or enjoy pet-sitting? Have you ever heard of a spiralizer?